Seeing Believing Having Holding brings together five American artists living across the United States: Kelly Akashi (Los Angeles, CA) Kahlil Robert Irving (St. Louis, MO), Michelle Lopez (Philadelphia, PA), B. Ingrid Olson (Chicago, IL), and Daniel Rios Rodriguez (San Antonio, TX). Each artist makes tactile, composite objects and images, generating conditions of doubt, pleasure, and a kind of skepticism in the face of physical fact. Expressive of varied subjectivities, together their works play our most stabilizing senses against each other. Provoking unsettling relationships between touch and vision, they register deeply felt bodily experiences colored by the United States’ precarious and destabilizing cultural moment. Michelle Lopez’s (b. 1970) distended forms appear to withdraw from the space they occupy even as they expose the fragility of material relationships and the built environment. The gaps, joints, and various means of fastening and connection in her sculptures create a spatial narrative of cause and effect relationships enacted by tension, gravity, and weight. Lopez’s suggestive, anthropomorphic objects tweak minimalism’s relationship of body to confidently perfect, abstract geometric form. She replaces those conventions of autonomous authority with contingent elements combining surreal exaggerations with a rough, anxious poetry built from construction’s primary components of metal, glass, steel cable, and stone. As Michelle Lopez’s work extends into the gallery space, stretching between ceiling and floor, B. Ingrid Olson’s (b. 1987) work exercises the power of compression. Frames, boundaries, molds, corners, walls, and the strictures of photography all shape the bodily forms and psychic spaces of Olson’s wall-bound works. Olson doubles rooms and architecture with bodies and their parts. Bent knees, limbs closed and open, hands and feet demonstrating points of contact, press up against mirrors and photographic surface. Here, “exposure” describes the harsh light of the flash and the body on display to itself and those looking at the work. Sculptures describe corners and surfaces as “splayed,” becoming models for room as corporal construction. Cast from molds, these intimate impressions convey the close physical contact of their making and the distance produced by the mold’s copies. Kahlil Robert Irving’s (b. 1992) work also mines the fertile spaces between compression and expression. Creating small worlds of objects and images, Irving synthesizes the meditative acts of traditional craftsmanship and the hyperactivity and plugged-in trauma of contemporary American society. 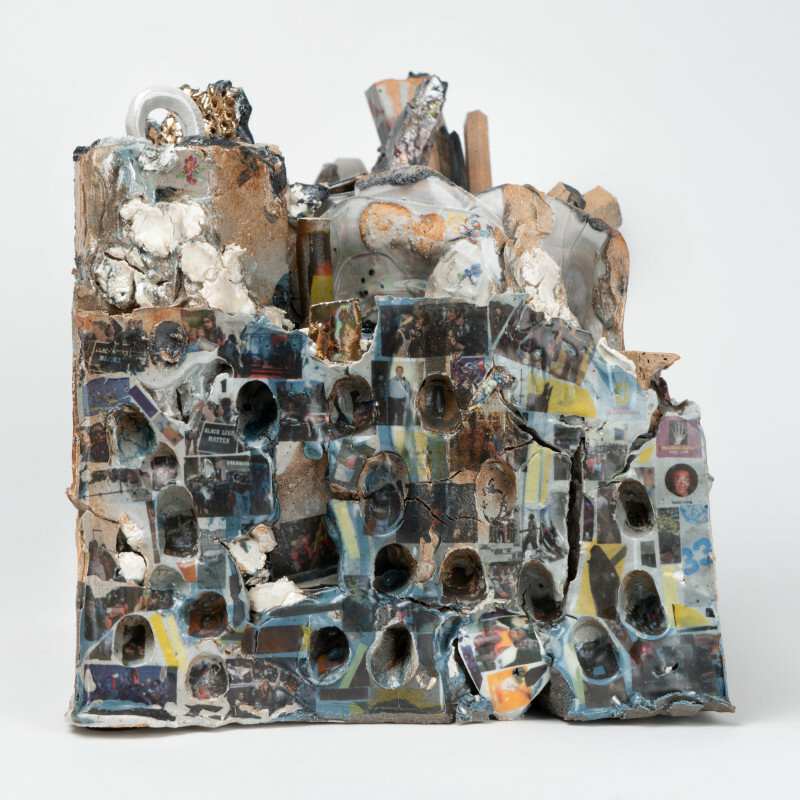 Irving’s ceramic sculpture controls a space between seeming randomness and careful choreography and narrative. As archeological core-samples of our present and very-recent past, the work Small Block – Mixed Melodies, (Jason Stockley cant run, Google scroll) storyboard the St. Louis protests following police officer Jason Stockley’s acquittal of the murder of Anthony Lamar Smith (Smith was shot by Stockley in 2011). Those images (which appear in a google image search of the protests) are embedded into a surface of varied textures, glazes, and materials, with impressions of the artist’s fingers doubling as wounds—the very human and material realities of weight, touch, and physicality adorned with the flood of images we encounter as we make our way in the world. Lopez, Olson, and Irving’s sculptural languages of scaffold, model, and memorial –means to support, define, and remember that which might be too large, obscure, or overwhelming to confront without these ancillary forms—finds pictorial expression in Daniel Rios Rodriguez’s (b. 1978) mystic diagrams. Tactile and playful, these paintings are meant to be held as much as seen, confusing the impulses of the eye and the hand. Incorporating objects gathered during walks taken in and around the San Antonio River Valley, Rodriguez places feathers, rope, pieces of wood, shells, and small rocks in conversation with an ecstatic painting style that reveres the natural world. By combining the distinct feelings of roadside sign painting, religious icons, early 20th century modernist abstraction, and the intimacy of domestic scale, Rodriguez articulates each affective difference into an unlikely physical image that seems to expand beyond its shaped boundaries. Kelly Akashi’s (b. 1983) sculptures. Pushing the limits of traditional glass blowing towards a strangely satisfying combination of bodily abjection and heady delight, they create a space entirely their own. Theatrical in gestures—her cast bronze finger sculptures point, beckon, and curl—are encased in an almost slapstick viscous drip of blown glass. The body is evoked at every turn: in the cast of the finger, in breath and physicality required to blow the glass. Hand and lungs, and stilled fluids of unspecified origin, combine to create a puzzle of action, gesture, and material. The play of transparency between Akashi’s sculptures and photograms, which reveal sculptural insides, turns everything inside out in a surreal comedy of fragility and mutability. Seeing Believing Having Holding is organized by Dan Byers. Dan Byers is the John R. and Barbara Robinson Family Director of the Carpenter Center for the Visual Arts at Harvard University, a position he has held since June 2017. Previously, he was Mannion Family Senior Curator at the Institute of Contemporary Art/Boston, and the Richard Armstrong Curator of Modern and Contemporary Art at the Carnegie Museum of Art, where he was co-curator, with Daniel Baumann and Tina Kukielski, of the 2013 Carnegie International. Before joining the staff at the Carnegie, he was Curatorial Fellow at the Walker Art Center in Minneapolis, and Assistant to the Directors at the Fabric Workshop and Museum in Philadelphia.